From Hanga (版画) #9, print 5. Probably published by Hanga-no-ie in portfolio form with five original prints by various artists. Some of these issues contained prints by up to 8 artists. There are at least 5 prints in the British Museum created by Susumu. Three of these are shown on-line. There are two prints in the Rijksmuseum, of which one is shown. The Art Gallery of New South Wales owns two of his prints. The Smithsonian owns one print, originally from the collection of Gerhard Pulverer. There are 9 prints, none of which is illustrated online, at the Museum of Fine Arts, Boston. The Chazen has one print. The Art Institute of Chicago has two. There are two at Harvard. One at the Mead Art Museum at Amherst. The Honolulu Museum of Art owns three prints by Susumu. The Weatherspoon Museum at the University of North Carolina has one. The Yokohama Museum of Art owns one print by Susumu. 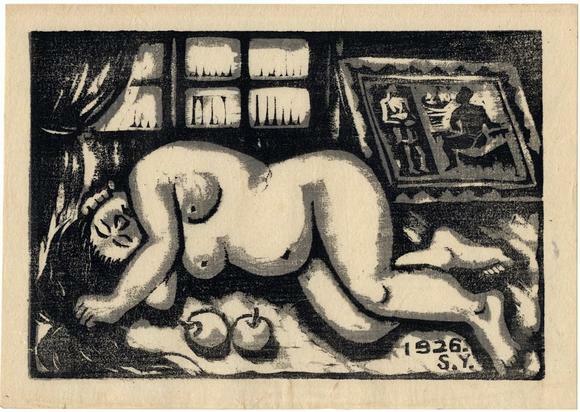 The University of Sydney owns one print, a cubist still-life also from 1926.